We explored the effect of winter cholecalciferol (vitamin D3) supplementation on innate immune markers in healthy Danish children (55°N). In the double-blind, placebo-controlled trial, ODIN Junior, 119 healthy, white, 4–8 year-olds were randomized to 0 (placebo), 10 or 20 µg/day of vitamin D3 for 20 weeks (October–March). Cheek mucosal swabs, blood samples, and questionnaires on acute respiratory infections the previous month were collected at baseline and endpoint. Innate immune markers were measured as secondary outcomes including in vivo oral mucosal gene expression of calprotectin (S100A9), lipocalin-2 (LCN2), beta-defensin-4 (DEFB4), interleukin-8 (IL-8), viperin (RSAD2), and the cathelicidin-antimicrobial-peptide (CAMP); ex vivo whole-blood lipopolysaccharide (LPS)-induced cathelicidin, IL-8, and IL-6; and plasma cathelicidin, together with serum 25-hydroxyvitamin D [25(OH)D]. Serum 25(OH)D was 56.7 ± 12.3 nmol/L at baseline and 31.1 ± 7.5, 61.8 ± 10.6, and 75.8 ± 11.5 nmol/L at endpoint after placebo, 10 and 20 µg/day of vitamin D3 (P < 0.0001), respectively. A decreased oral mucosal S100A9 expression with placebo [− 18 (95% CI − 1; − 32)%] was marginally avoided with 20 µg/day [6 (− 13; 28)%] (P = 0.06). Likewise, a decreased LPS-induced IL-8 with placebo [− 438 (95% CI − 693; − 184) ng/L] was marginally avoided with 20 µg/day [− 109 (− 374; 157) ng/L] (P = 0.07). All other immune markers and respiratory infection episodes were unaffected by vitamin D3 supplementation (all P > 0.11). 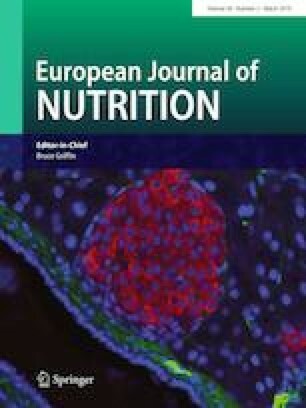 Winter vitamin D3 supplementation of 10 µg/day did not affect innate immune markers, whereas 20 µg/day tended to maintain the capacity to produce a few markers in healthy children. Hanne Frøkiær and Camilla Trab Damsgaard have contributed equally to this work. The online version of this article ( https://doi.org/10.1007/s00394-018-1671-8) contains supplementary material, which is available to authorized users. The authors’ responsibilities were as follows—HH, C Mølgaard, HF, and CTD designed the research; HH, C Mortensen, C Mølgaard, SBM, HF, and CTD conducted the research; HH performed the statistical analyses and drafted the manuscript; CR provided statistical guidance; HF and CTD assisted in the manuscript preparation; all authors: read and approved the final manuscript. We thank all the participating children and their parents. This project was funded by Lundbeckfonden (R180-2014-3481), by Brødrene Hartmann’s Fund (A26842), and by the European Commission (FP7/2007–2013) under Grant Agreement 613977 for the ODIN Integrated Project (Food-based solutions for optimal vitamin D nutrition and health through the life cycle http://www.odin-vitd.eu/). Minisun vitamin D and placebo tablets were provided by OY Verman Ab. The study was approved by The Committees on Biomedical Research Ethics for the Capital Region of Denmark (H-3-2014-022) and conducted in accordance with the Declaration of Helsinki . Written informed consent was obtained from all legal guardians of the participating children.